These oatmeal peanut butter bars. Oh my, yum. Seriously, so good. Plus – they’re secretly quite healthy. Which means you can eat lots right? No? Yeah, okay, there’s still peanut butter, and quite a bit of it, in them. And I suppose you shouldn’t really consume truckloads of that stuff. It’s healthier than a lot of things though, and a little bit is definitely fine. So I’m declaring these oatmeal peanut butter bars healthy. Seriously though, there’s no refined sugar and no flour. The entire 8×8 inch pan of bars has only 1/4 cup of honey to sweeten them, and they’re sweet enough! 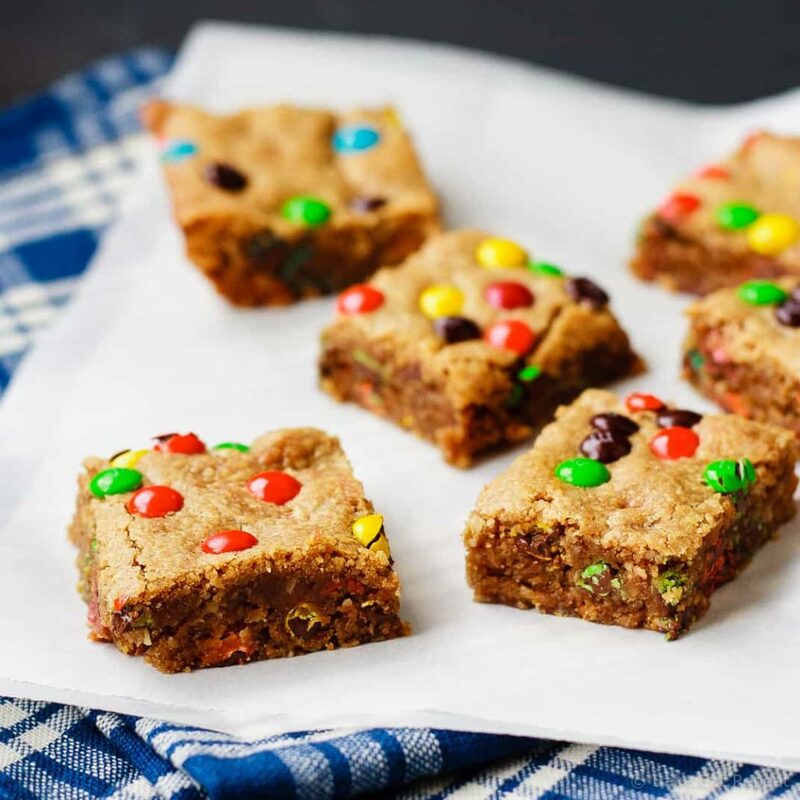 Yes, there’s some mini M&M’s in there, because I couldn’t resist making them into a monster cookie like bar (for the kids – obviously). You could easily reduce the number of M&M’s to 1/4 cup for the whole pan from the 1/2 cup I noted. I did that for one batch and it was chocolatey enough, so it just depends on how much chocolate you want in there. I think they would even be quite tasty without any chocolate in them at all. Which is saying something since we all know how much I enjoy my chocolate! These oatmeal peanut butter bars even worked quite well with natural peanut butter if you prefer that. I did find they were a bit drier with the natural peanut butter though, so just be very sure not to over bake them if you go that route. We did prefer the regular peanut butter for these (although I wouldn’t say no to one with the natural stuff, so there’s that!). Also, cold out of the refrigerator? Divine. 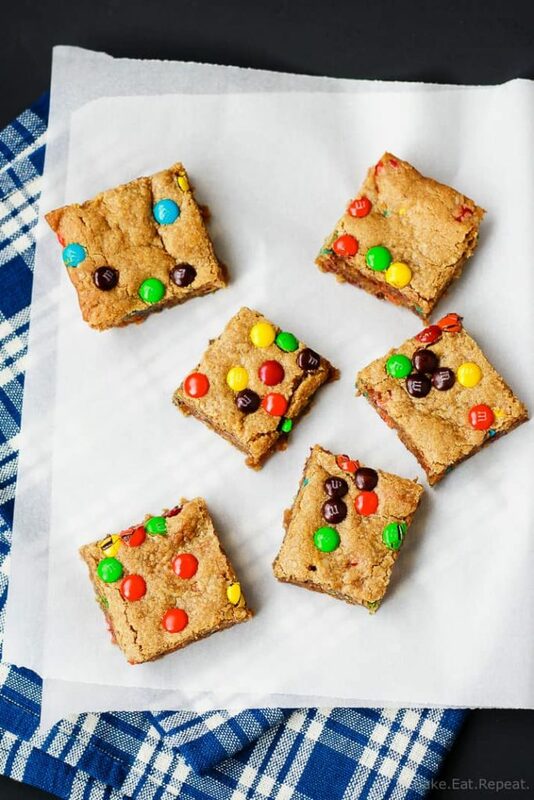 A soft and chewy oatmeal peanut butter bar that can be mixed together in 10 minutes and is much healthier than the monster cookie bar it resembles? Yes please. I also shared this oatmeal peanut butter bars recipe over on Food Fanatic, so be sure to check it out over there too! There is nothing wrong with a sprinkling of M&M's for fun especially if you have slashed the sugar. 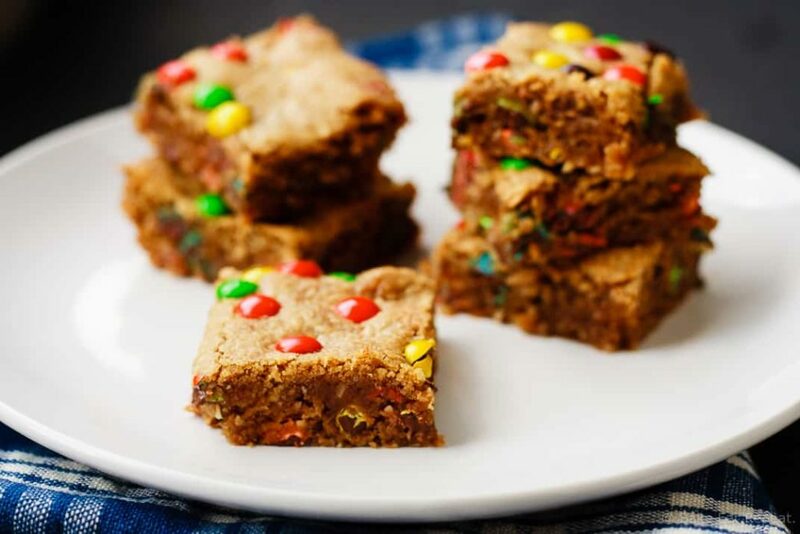 These look absolutely scrumptious and peanut butter anything is tops in my book. That said, I tend to consume more almond butter. Do you think these would work with that? That's what I figure, M&M's are just plain fun! I haven't actually ever baked with almond butter so I couldn't say, but if it generally bakes the same as peanut butter I would imagine it would be just fine. Let me know if you try it! Thanks Lynn! These would make a great lunch box treat too! Yup, unfortunately our school is nut-free so I can't send them, but they work well for after school so it's all good! Totally way better for you than a ton of treats! I would LOVE these! I can never ever turn down peanut butter and oats together! I can never turn down anything with peanut butter, it's too good! Thanks Ashley! These look amazing! And the oatmeal definitely makes them secretly healthy. Sure, they have candies, but they are minis so that counts too, right? Yummy! Exactly! Besides, I really do think they'd be great without the M&Ms and then they're definitely pretty healthy - just not as fun and pretty! :) Thanks Rachel! If you declare these healthy, I am totally on board. And that means we can have them for breakfast, right? I am a PB fanatic - I need to make these ASAP! Hahaha, my kids would have loved if I had let them eat them for breakfast. PB and oats though, why not?! Thanks Cate! All my favorites in bar form- love the m&ms. Pinning! These look like the perfect Back to School treat! Oatmeal, peanut butter AND M&Ms? Sign me up! Pinned! Totally means you can eat more of them, that's always what I decide! :) Thanks Manali - I was pretty happy to finally change up the design! Ooh yes! I love secretly healthy desserts! I'm totally good with these being considered healthy. Even if they DO have candy in them. Candy is good for the soul. ;) Seriously though, these look amazing and I want them in my mouth right now! Good for the soul hey? I'm on board with that! And I'm definitely still considering these healthy - I just compare them to everything that's much worse and then they look super healthy! :) Thanks Jess! That's what peanut butter stuff is around here too, the kids can't bring it to school. So we make sure to get our fill of it at home! Thanks Kacey! Of course they're healthy! And anyone wanting to cut the M & Ms is not my friend. :) They look so peanut buttery and chewy! Yeah, I wouldn't really understand wanting to omit the M&Ms, but they would still be pretty good. But better with, definitely! Thanks Mir! I could get down with these bars! Oatmeal, peanut butter, and m&m's! It's everything I love about dessert! Yes! Secretly healthy means that I can devour this entire batch! :) Love the combination of oatmeal and peanut butter, Stacey! And the m&ms provide the perfect touch. So pretty! My thoughts exactly Gayle - healthy totally means you can have more right? !